Kirsty and Mark wanted to host a relaxed wedding for their guests that included all of their favourite things, plenty of wintery touches and a delicious winter feast. 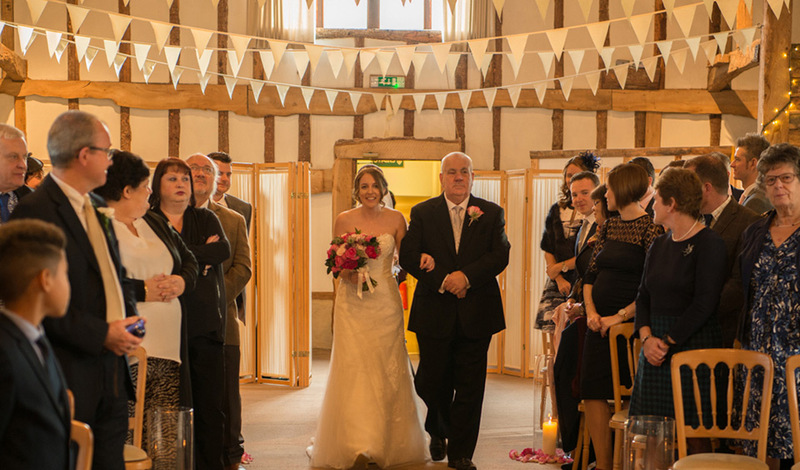 Kirsty and Mark knew that Clock Barn was ‘the one’ as soon as they walked in the door and they admit that after their showround, they spent the rest of the day thinking about their visit! Kirsty and Mark kept their decorations to a minimum as neither of them wanted to draw attention away from the barn by adding too many decorations. 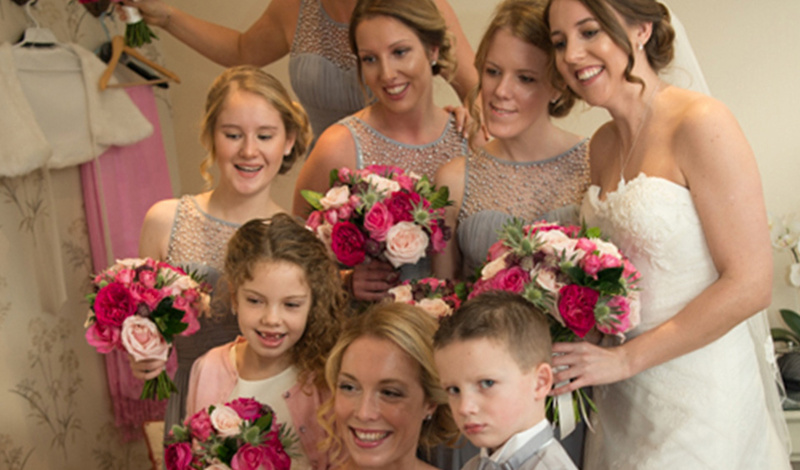 Kirsty did know from the outset that there had to be pink involved in her wedding day and so the couple opted for a fabulous pink and grey theme with some very special additional touches made by friends and family. 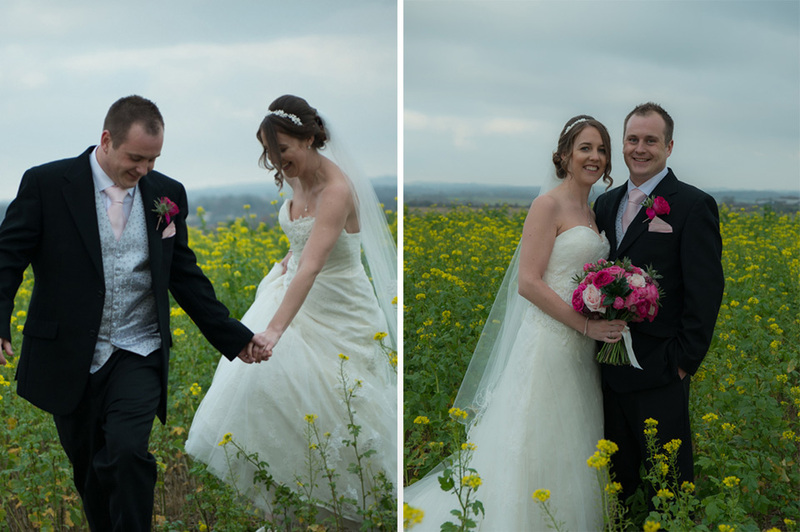 Kirsty and Mark also made the most of their flowers, moving the little vases from the ceremony table to the fireplace and top table after the ceremony. The centrepieces with lanterns, candles and flowers were a fabulous floral touch and really gave that warm and cosy feel that the couple were looking for. 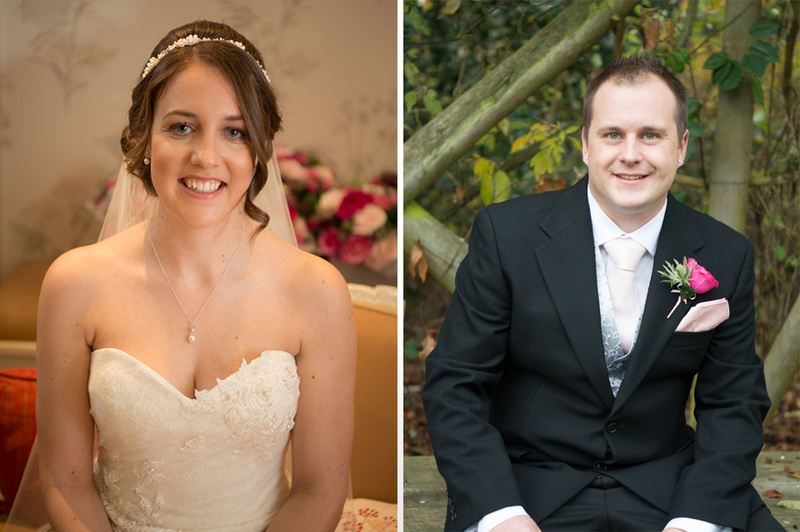 Kirsty chose a fantastic Justin Alexander gown from Amaryllis Bridalwear after falling in love with the lace and tulle design. 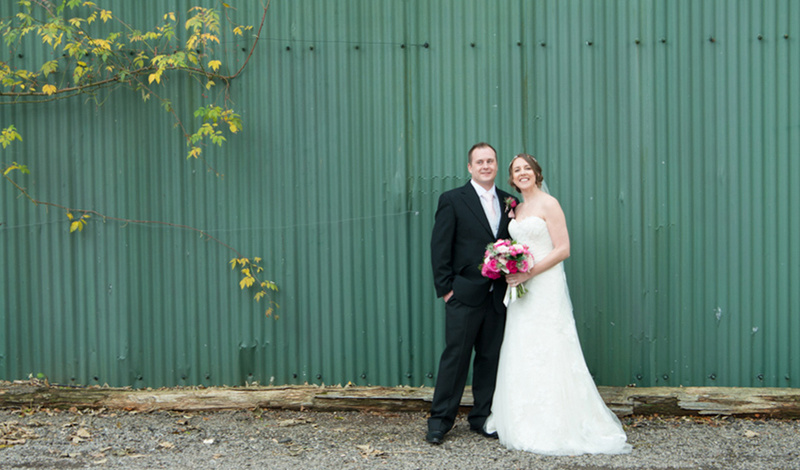 The nipped in waist was incredibly flattering and even though Kirsty found her gown 19 months before the big day, she didn’t doubt her choice once. 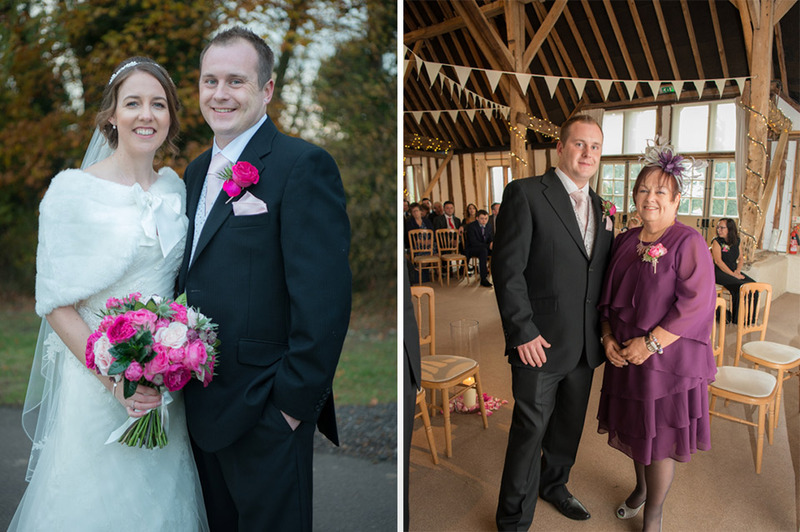 Groom Mark hired suits from Slaters in Basingstoke and his plain black suit was a great choice for a winter wedding. Whilst Mark wore a pink tie and pocket square, the groomsmen wore grey versions to fit the theme and they also wore matching grey and pink cufflinks, a gift from Mark. Kirsty really wanted the bridesmaids’ bouquets to stand out against their dresses so opted for grey gowns for her maids. A pink wrap was the perfect seasonal accessory for the bridesmaids and Kirsty gave all her bridesmaids pearl bracelets and charms as thank you gifts. In addition to this delicious menu, Kirsty and her best friend, bridesmaid Verity (aka The Muddy Bakers!) made the wedding cake! It was a masterpiece with layers of chocolate and orange, lemon and gluten free sponge. Kirsty was taught to bake by Joyce, a family friend, and so Joyce made the cake’s fruit tier. With everyone warm and cosy, Kirsty and Mark hit the dancefloor and their first dance was the first time they’d ever danced together! After that, a great DJ from Les Hart Entertainment Agency kept the party going late into the evening. If you’re planning on a stunning vintage style for your wedding day, then make sure you take a look Hayley and Dan’s 40s and 50s-inspired special day first. You won’t want to miss it!